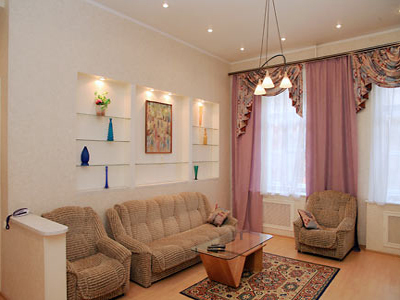 This smart spaceous apartment is located very close to Nevsky Prospect, in 2 minutes by feet. There are 2 bedrooms in the apartment, with king-size bed in the 1st and folding sofa in the 2nd bedroom-cabinet. A drawing room and kitchen are combined with dining room. Kitchinette is fully equipped for cooking. There is one bathroom with heated floor. The apartment is originally designed. Safe entrance from the yard. 3d floor, there is lift in the building. All sights of the historical center are close to the apartment - in a short walking along the Nevsky Prospect. Best restaurants, plenty of cafes, best shopping — everything is right around the corner. The nearest metro stations are Vladimirskaya and Mayakovskaya.